Original Fish Tacos!We were on vacation and decided to grab a quick bite at Rubio's.Added a chopped salad and it was a perf...My wife still orders the chopped chicken salad with chipotle dressing. Sustainable Wild Alaska Pollock, beer-battered by hand and cooked to crispy perfection. Available a la carte or as a Two Taco Plate. Taco Plates are served with "No-Fried" Pinto Beans™ and tortilla chips. Our original white sauce, mild salsa and cabbage. Fresh guacamole, cheese, our original white sauce, mild salsa, cilantro/onion and cabbage. Enjoy our flight of three sustainable tacos: The Original Fish Taco®, Salsa Verde Shrimp Taco & Wild Ono Taco. 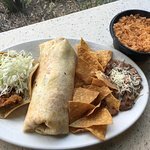 The Original Fish Taco®, Classic Grilled Shrimp Burrito, pinto beans and chips. Mix & Match any two tacos, "no-fried" pinto beans™ and chips. Available a la carte or as a Two Taco Plate. Taco Plates are served with "No-Fried" Pinto Beans™ and tortilla chips. Served on a stone-ground corn tortilla unless noted. A toasted blend of cheeses, all natural bacon, avocado and cilantro/onion layered with two chile sauces. Sliced avocado, cheese, creamy chipotle sauce, cabbage and cilantro/onion on a flour tortilla. Grilled or House Blackened. Fire-roasted corn, creamy chipotle sauce, cilantro/onion and cabbage. Mango salsa, fresh guacamole, cabbage and creamy chipotle sauce on a flour tortilla. Fresh guacamole, citrus rice, black beans, lettuce, roasted chipotle salsa, salsa fresca and creamy chipotle sauce. Pinto beans, cheese, mexican rice, salsa fresca and creamy chipotle sauce. Toasted cheese, all natural bacon, avocado, blackened jalapeños, citrus rice, salsa fresca, roasted chipotle salsa and chipotle sauce. Grilled or House Blackened. Guacamole, fire-roasted corn, mexican rice, cabbage, cilantro/onion and chipotle sauce. Wild Alaska Pollock, fresh guacamole, black beans, our original white sauce, mild salsa, cabbage and cilantro/onion. Toasted cheese, avocado and cilantro/onion layered with two chile sauces. Available a la carte or as a two taco plate. Guacamole, Citrus rice, black beans, lettuce, roasted chipotle salsa, salsa fresca and chipotle sauce. Our chicken is raised without antibiotics. Taco Plates are served with "No-Fried" Pinto Beans™ and tortilla chips. 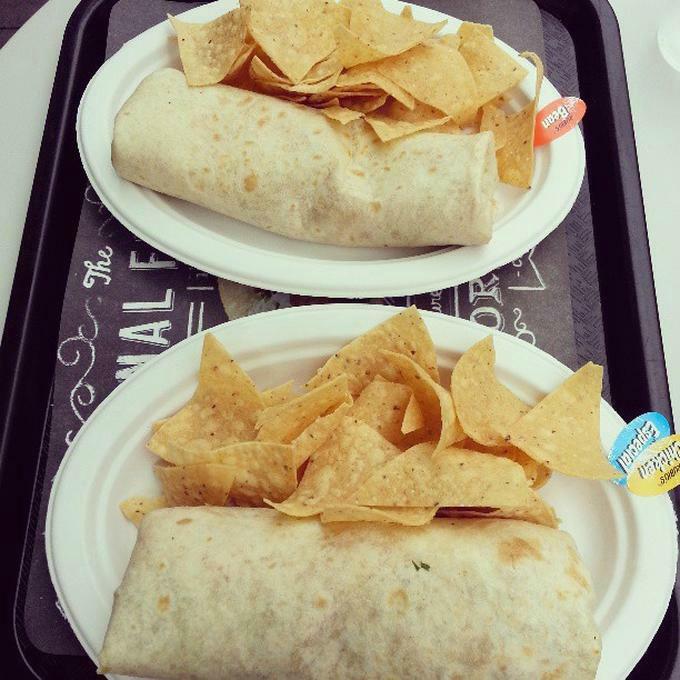 Burritos are served on a flour tortilla with a side of tortilla chips. Chicken or Steak. Toasted cheese, all natural bacon, avocado and cilantro/onion layered with two chile sauces. Chicken or Steak. 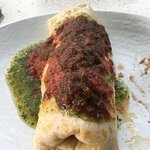 Fresh guacamole, cheese, salsa fresca, lettuce and drizzled with chipotle sauce. Served with "no-fried" pinto beans™ and tortilla chips. All natural chicken or steak. On street-sized tortillas with fresh guacamole and cilantro/onion. Available a la carte or as a three taco plate. Chicken or Steak. Citrus rice, black beans, lettuce, roasted chipotle salsa, salsa fresca and chipotle sauce. Chicken or Steak. Melted cheese and salsa fresca. Cheese or Chicken. Cheese, fresh guacamole, sour cream, salsa fresca and chips. Cheese or Chicken. Cheese, fresh guacamole, pinto beans, sour cream and salsa fresca. Our signature "no-fried" pinto beans™, cheddar, jack and mozzarella cheese and mild salsa. Served with your choice of seafood, grilled all natural chicken or grilled veggies. Mandarin oranges, avocado, fire-roasted corn, fresno chiles, black beans, tortilla strips, white sauce, baby greens and chipotle orange vinaigrette. Grilled peppers, zucchini & onions, fire-roasted corn, avocado, baby greens and with a lemon agave white balsamic dressing. Cheese, tortilla strips, salsa fresca, mild salsa, cabbage, romaine lettuce and chipotle dressing. Fresh guacamole, citrus rice, black beans, lettuce, chipotle sauce and salsa fresca topped with roasted chipotle salsa or salsa verde. Brown rice & quinoa and romaine lettuce, topped with fire-roasted veggies, fresh sliced Hass avocados, black beans, cilantro lime mojo sauce and toasted almonds. Baby greens with mango salsa, brown rice & quinoa, fresh sliced Hass avocados, crisp tortilla strips, and drizzled with a lemon agave white balsamic dressing. The first restaurant was opened in 1983 in San Diego by Ralph Rubio and his father, Ray, who started the fish taco phenomenon that spread across the nation. 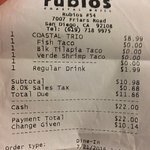 Today, Rubio’s menu has grown from The Original Fish Taco® to include additional chef-crafted seafood recipes that feature shrimp, wild salmon and ono. 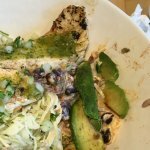 In addition to sustainable seafood, Rubio’s offers chargrilled chicken and steak, fresh made guacamole and salsas and sauces that are prepared daily. An OK Little Place to Get Quick-Service Mexican Food. Had steak street taco's... and they were of course ... perfect. Added a chopped salad and it was a perfect meal. Food is quick and fresh and just always on point. 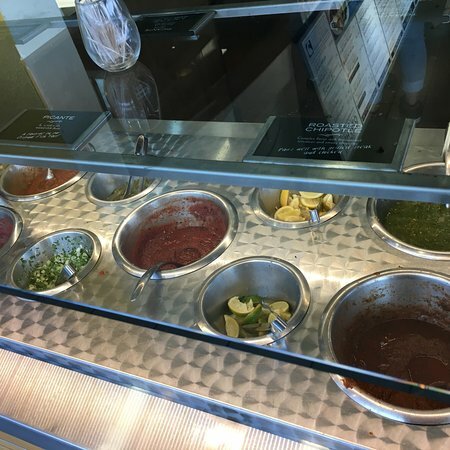 Very clean, decent pricing, nice staff, great selection of salsas. I like the fish tacos sitting outside. This is the best place for Taco Tuesday after 2:30pm until closing. It is only $1.75 for fish taco's. My wife still orders the chopped chicken salad with chipotle dressing. I love the mango ice tea also. These were just outstanding. Fresh, perfectly cooked salmon, nice veggies and super sauce. Rubio's never disappoints. Get quick answers from Rubio's Coastal Grill staff and past visitors.